On October 22nd, 1993, I brought Shassi home. She had been born on August 27th, 1993. Now, it's two months shy of her 14th birthday. I see her growing more vague now. She's nearly blind and at least partly deaf. (We don't know how deaf; since she's never listened to a thing I said in her entire life). She has progressed from giving other dogs the evil eye to trembling violently if she encounters one. She has her little routine with my mother and aunt and spends most of her time sleeping now. She needs some help in and out of the car. It's funny how a dog's life can mark an era in a human's. I got Shassi when I was 16 - an awkward, self-hating, undersocialized 16. Now I'm three months shy of my 30th birthday. Well, I'm a bit more socialized at least. During Shassi's tenure, I graduated high school - back when it still meant something, left home, started The Misanthropic Shiba, graduated from college, joined the military, left the military and returned to Nanaimo. Shassi, ever since she toddled into my life, has always been her own dog. At first, it was startling and almost offensive. Dogs were supposed to come when they were bloody well called, dammit! They were supposed to at least pretend some regard for you past the thirteen seconds that it took to ascertain that you hadn't brought any meat or cheese home from the store. They weren't supposed to be the catalyst for the most absurd events that cling to the memory of one's growing up. We got used to it, even to the point of dragging out the latest Shassi story whenever someone wanted to know if anything interesting had gone on in our lives. Shassi was the dog that everyone gravitated to, proving once again that people are attracted to beings that couldn't care less if everyone around them lived or died. Kena and Buddi, the elder dogs of the pack, were perfectly happy being petted and made much of, and I daresay they got their fill. But Shassi was special. A dog unto herself. I wish I was more like her. Not to the point where I say, "To hell with everyone!" and live only for my immediate gain. But to the point where I can forgive myself and think well of myself even if I've made mistakes or done something stupid or thoughtless or careless. The ability to take note of a situation, take the lessons to heart and move on is something that my dog possesses that I really wish I did. But I'm only 29 and I have time. Shassi is nearly 14 and her sun is setting. I believe that she has a year or so left; perhaps even two or three. But it won't be long, in the terms of a human lifespan. Shassi, dog of my childhood, I love you. For your sake and the sake of all the dogs who I was privileged to share my life with, I wish - I hope - that there is a better beyond where we will meet again. I have been a fan of Shassi's for a very long time. I am a trained human handler of a black and tan Shiba. when i read your Misanthropic Shiba post, i laughed as it was all so very familiar. Nikko was a puppy at that time. what you wrote about neutering, i made Nikko's dad read.. and thats what got him to agree to getting our boy fixed. i am very saddened to hear about what is happening with her at this time. I pray for her comfort. she has led a very happy life and she has certainly touched mine. I am tearing as i type this. Thank you for the stories and the comics. 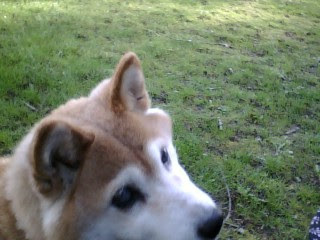 My best shiba kisses to Shassi... if her highness will allow such a thing. I found The Misanthropic Shiba after I adopted Bandit, a dog from the SPCA they said was part Shiba Inu. I'd never heard of the breed, so I did some research. Your website was extremely helpful. Bandit is the most wonderful tricolor dog in the world. But if I'd known about that double coat twice a year shedding before I adopted her - I'd have missed out on an amazing dog. But hey, what's a little loose fur between friends? Shassi has been an inspiration to many of us who fell in love with the Shiba at first sight, without ever knowing what it was that we fell in love with. She all lead us down that dark path of awareness and yet, taught us that Shibas were not to be feared, but rather worshipped. I do not know of any person who has a Shiba who has not read Misanthropic Shiba. It is required reading material. Shassi is what all Shibas inspire to be. I don't even have a Shiba but am inspired by your words for your dogs and yourself! I love dogs and have 2 tiny spirits(live ones!) that lighten up our lives everyday. This is the hardest part of when a dog decides to own a human...poor Shassi. It makes me tear up, too, cause I have to realize my 8 year old shiba won't be around forever...but I'll think about that another day. I inclination not agree on it. I regard as polite post. Expressly the designation attracted me to be familiar with the intact story. Dogdammit, you get up early! Boss puppy? I don't think so!